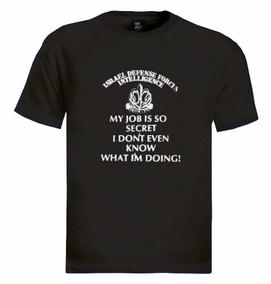 Hilarious vintage Israeli T-Shirt of I.D.F's Intelligence corps. In the middle of the print, the intelligence emblem is printed and matching text: "Israel Defense Forces Intelligence". Funny slogan on bottom: "My Job is so secret I Don't even know what I'm doing".Made from 100% High-quality combed cotton T-shirt. Our t-shirts are made of 100% cotton and are long lasting with bright colors. Our products are all designed and printed in Israel.